When it comes to performing an audio file format conversion, it's important to use a quality program to avoid losses or problems during the conversion. 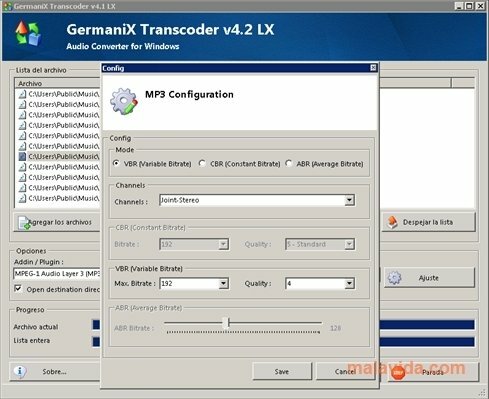 GermaniX Transcoder is an application developed by GermaniX, a company specialized in audio and video software, so that results are almost guaranteed. The amount of formats that GermaniX Transcoder allows, including AAC, FLAC, PAC, APE, MP2, MP3 (configurable with variable and fix bitrate...), MPC, OFR, OGG, SHN, SPX, TAC, TTA, WMA, WV and ALS, make it one of the most versatile converters on the market. The application's interface is the usual for this kind of program, with an area where we will be able to see the files that are in the conversion queue, the configuration buttons necessary (with access to the advanced configurations) and the progress indicators. GermaniX Transcoder's conversion speed is quite good, something that together with the quality of the resulting files will convince the majority of users that they are in front of a really good application.